In order to receive a diploma at Liberty Prep, candidates must successfully complete the requirements for graduation with a minimum of 24 credits earned in required core and elective courses. Students must be full-time enrolled students each high school year. Liberty Prep does not accept students transferring in for the senior year. Students must maintain a grade point average of a 2.0 or above to receive a diploma. All core courses needed for graduation are one full credit – combinations such as ½ credit of one course and ½ credit of another may not be used. Although students may receive credit for completing a semester of a core course, this credit may be used as an elective credit only and not as core course credit toward graduation under any of the diploma tracks. (i.e. If a student completes one semester of Algebra I only for ½ credit, the ½ credit may apply toward an elective, but will not count toward the four required High School math credits.) The exception to this is in the case of a student who transfers into Liberty Prep between the fall and spring semester. In this case, students may receive ½ credit for the successful completion of a course at another school for the fall semester, may start that same class in the spring semester at Liberty Prep and then receive ½ credit for the successful completion of the course, earning a full credit. Transfer students are required to earn a minimum of 24 credits in high school courses, with a minimum of 5 credits being earned each high school year at Liberty Prep; and, 3 of those credits being in core classes. Any individual exceptions to the graduation requirements may only be granted by the Dean of School. All students entering high school shall meet with the Academic Advisor to map out an expected diploma plan, which will then be filed with the student records. When needed, advisement will be given in regards to the transferring in of credits. Any requests for transfer credits must be assessed before new students are allowed to register. The Dean of School and/or Academic Advisor must approve all changes to the student’s filed diploma plan. Current Liberty Prep students (9th grade and higher) must have a diploma plan on file prior to registering for classes. Diploma options at Liberty Prep are based on the North Carolina state requirements for graduation. The requirements are listed, with recommendations also listed. 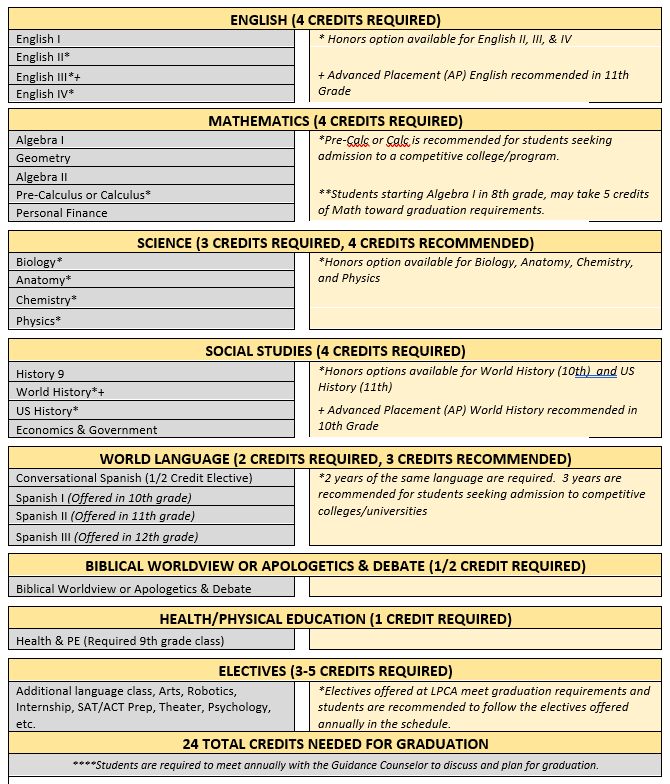 All students are required to meet the minimum standards for graduation listed below. Students wishing to pursue a more rigorous course of study may select option to take various Honors and AP classes. Please see Course Catalog for full selections.